If you have any additions or questions feel free to fork the project or open up an issue on github. I recently wrote about using ruby-aaws on Heroku. I used it for creating a virtual bookshelf on my website, so anybody interested in what I read can have a look at the ISBN, price, description and some reviews (in german). 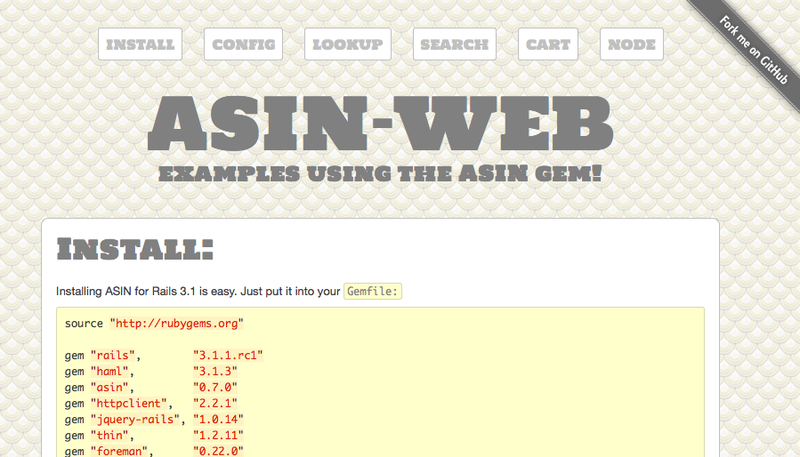 Since this is a trivial scenario it covers only a fragment of features that ruby-aaws offers. If you look into the source and documentation of ruby-aaws you will see that it is no fun to patch anything in there… I think I would not have done it without the help of Ian Macdonald. Another thing was, that I could not use the builtin caching facility of ruby-aaws, cause it simply does not work on Heroku’s readonly file-system. If you have a look into the Amazon documentation you see that it is quite easy to call the API via REST. Just append some query parameters to your desired endpoint (f.e. webservices.amazon.com) and as a result you get the desired information from Amazon. The tricky thing is, that since recently you have to sign your request with your AWS credentials. I did not find any specs on how to do that on the documentation, but Cloud Carpenters had a nice example using Python that I adapted for Ruby. There is also the nice Amazon API signing service that frees you from self signing your requests. The reason I did not use it, is that it supports the amazon.com endpoint only (I need amazon.de). You can tailor the Item class to your needs by opening up the class and provide the methods you like or doing something entirely different with the raw attribute. OR, just fork me on GitHub! Maximum flexibility with some syntactic sugar!